Rybka won the CCT11 tournament! The annual computer chess tournament was held this weekend on Internet Chess Club. The Rybka team was using a cluster of 9 computers working in parallel for the event. As Rybka doesn’t support cluster splitting yet, a special Rybka version was created for this purpose. In this position from DIEP - Rybka game Rybka clearly sees that she wins the ending giving the rook away with 36…Rxf3! move. So she went to it several moves before. The 18th traditional TopGM’s blindfold and rapid tournament in Nice, France will take part from Mar 14th to 26th. Players: V. Topalov (BUL, 2796), World Champion V. Anand (IND, 2791), V. Ivanchuk (UKR, 2779), M. Carlsen (NOR, 2776), A. Morozevich (RUS, 2771), T. Radjabov (AZE, 2761), World Exchampion V. Kramnik (RUS, 2759), P. Leko (HUN, 2751), L. Aronian (ARM, 2750), Wang Yue (CHN, 2739), G. Kamsky (USA, 2725), S. Karjakin (UKR, 2706). Average ELO is 2759. It is 20th FIDE tournament category. Final Standings: 1. 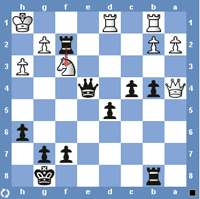 Aronian – 14; 2-3. Kramnik, Anand – 13½; 4. Carlsen – 13; 5. Morozevich – 11; 6-7. Topalov, Karjakin – 10½; 8-9. Kamsky, Leko – 10; 10. Ivanchuk – 9½; 11. Radjabov – 9; 12. Wang Yue – 7½.